Stripe is a payment solution which lets you accept payments online. It is a full stack solution which replaces the need to have a payment gateway or a merchant account separately. Stripe processes your payments (acting as a payment gateway) and also deposits the funds in your bank account (acting as a merchant account). It cannot be used with your existing payment gateway or merchant account. The following criteria can be considered before choosing Stripe as a payment solution. Countries supported: Stripe is available in countries like United States, Australia, Austria, Belgium, Canada, Denmark, Funland, France, Germany, Hong Kong, Ireland, Italy, Japan, Luxembourg, Netherlamds, New Zealand, Norway, Portugal, Singapore, Spain, Sweden, Switzerland, United States and United Kingdom. Stripe is also available in beta and private beta in some countries. Payment Methods: With Stripe, you can charge almost any kind of credit or debit card. U.S. businesses can accept Visa, MasterCard, American Express, JCB, Discover and Diners Club. Australian, Canadian, and European businesses can accept Visa, MasterCard and American Express. Data Portability: Stripe supports data portability . If you decide to switch between payment providers, Stripe lets you do so by exporting the card information of your customers into a PCI compliant vault. Every Stripe account has two modes : A test mode and a live mode. Stripe's test mode is similar to the live mode and has all its features. However, you cannot accept real payments from customers using the test mode. In the test mode, you can simulate transactions using test cards. Test card numbers are provided in later sections. Testing will help you simulate a real time payment scenario. It is advisable to carry out test transactions before carrying out live transactions. To switch from the test to live mode, you will have to activate your account . This requires you to furnish basic information about your business, your bank account etc. This essentially means that Chargebee automatically takes care of connecting to the appropriate Stripe mode based on your Chargebee site's type. 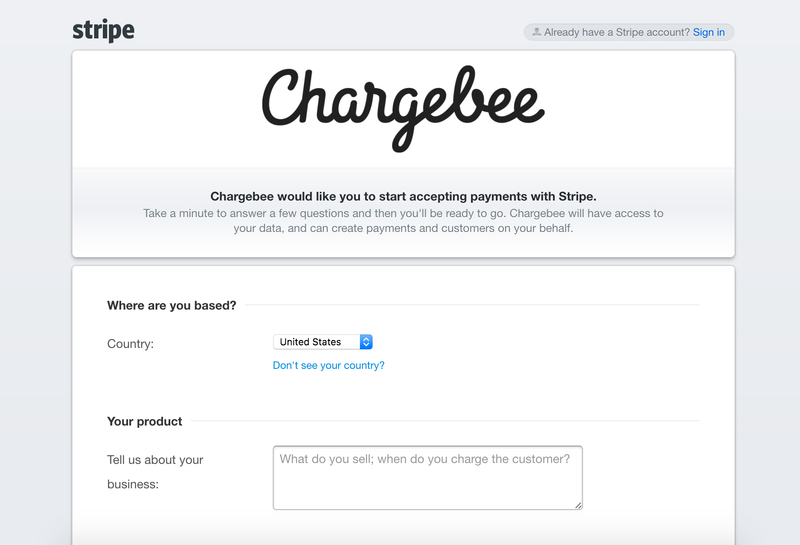 Chargebee offers the following options to integrate with Stripe. In this method the card information of the customers are collected by Chargebee's secure hosted pages and directly passed on to Stripe. Your PCI compliance requirements are greatly reduced because of Chargebee's hosted pages. As a merchant using Chargebee's hosted pages, all you have to do is submit a Self Assessment Questionnaire (SAQ-A) to stay compliant. In this method, collecting card information will have to be handled at your end and has to be passed on to Chargebee. Chargebee then routes this card information directly to Stripe. As a merchant, since you will be collecting card information directly, you will have to take care of PCI Compliance requirements. In this method, Stripe gives you a payment form which can be embedded in your checkout page. This way, your PCI requirements are reduced. The card information collected via the payment form is directly sent to Stripe. Checkout these tutorials which would help you in setting up Stripe js with Chargebee. Chargebee makes use of Stripe Connect to safely connect to your Stripe account directly. This way, you will be redirected to Stripe's login page where you will have to authenticate your Stripe account by entering your login details. If you do not have a Stripe account, Chargebee also gives you the option to create a new account. To add Stripe to your site, go to Settings > Configure Chargebee > Payment Gateways and click Add a Gateway. You will now see a list of Payment Gateways. From the list, select Stripe. Once you are on the Stripe Gateway page in Chargebee, you will have an option to either create a new Stripe Account or Connect to an Existing Account as shown below. Instructions for connecting your Stripe Account to Chargebee in both the cases are discussed below. Selecting this takes you to Stripe and gives you an option to create a new account by configuring details about your business, your Social Security Number etc. Selecting this takes you to the Stripe Login Page where, by logging into your account, your Stripe account is connected to Chargebee. 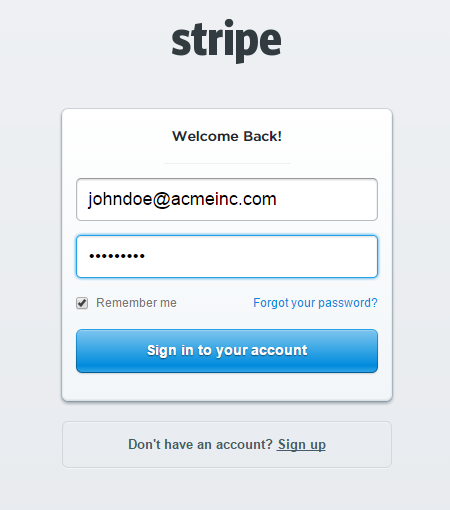 After you select Sign in with Stripe to connect, you will be redirected to the Stripe Login Page. Once you login with your Stripe credentials, you will be redirected to Chargebee with your Stripe account automatically connected. An option to Reconnect your Stripe account is also provided once you integrate your Stripe account. In event of any transaction failures with the message "access denied by gateway", make use of the Reconnect option (at the top right of the configuration page) to re-establish a connection. Ensure you do not revoke Chargebee's access to your Stripe account. In such an event, use the Reconnect option to re-establish a connection. Additionally, you can choose whether to retain card information (if you have more than one gateway working simultaneously), configure supported card types and disallow prepaid cards as a payment method on the configuration page. 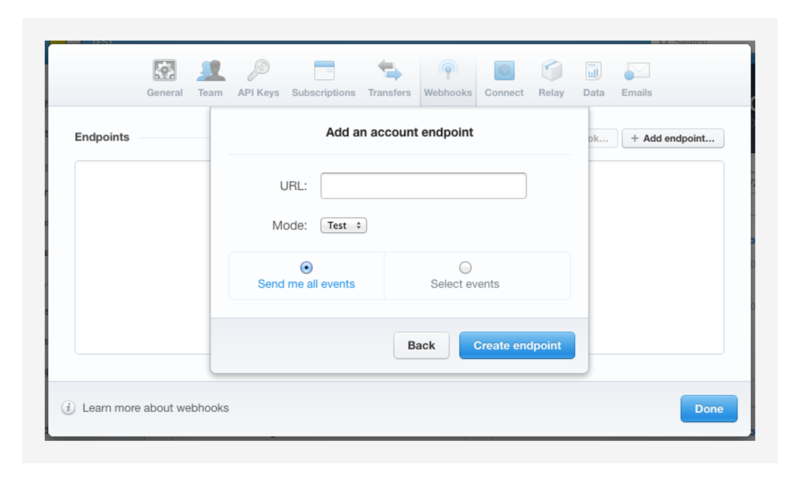 Stripe uses webhooks to notify your site of events related to your Stripe account. Stripe's webhooks for test and live sites need to be configured separately. Once the Notification URL provided by Chargebee is configured in Stripe, Chargebee would receive notifications of all events in Stripe. To configure the webhook, in your Chargebee site, navigate to Settings > Configure Chargebee > Payment Gateways > Stripe - Gateway Configuration page and copy the Notification URL. Now, in your Stripe Dashboard, if your are using Stipe's Live Site, navigate to API > Webhooks > Add Endpoint and paste the notification URL given on your Gateway Details page. Chargebee will listen for Card Update events. Stripe works directly with card networks and updates the card automatically so that a customer's card would work even if their physical card is replaced by the bank. You can enable this feature by adding the Notification URL that Chargebee provides in your Stripe account's webhook settings page. to know more about Stripe's Rules on the verification of CVC and ZIP code. The card numbers provided here can be used for testing card transactions in Chargebee's Test site in the test mode of your Stripe account. While testing, use any number for CVV and a valid future date for the expiry date. Attempts to charge will be declined with a Card Declined error. Card can be added but attempts to charge will fail. Charge will be declined with an "Expired Card" error. Auth and capture is a process where funds in your customers' card are authorized and earmarked for a duration of 7 days for a transaction. The merchant can claim the authorized amount within this tenure. This is extremely useful for merchants who have a delayed fulfillment process. Currently supported only for one time charges. Authorize - When a merchant authorizes a transaction, Chargebee will check the customer's credit card to check the availability of authorized amount. Then, a hold will be placed on the card for that amount for a particular tenure. You can hold the funds only for a maximum for 7 days. Authorizations expire automatically after 7 days. Capture - During this tenure, the merchant can issue a capture request to collect the authorized funds. The merchant must collect the funds within the authorized tenure. If not, he cannot collect them later. A new auth and capture request must be called. Uncollected funds will be released back to the card. You cannot capture more than the authorized amount. Partial and Multiple captures are not supported. Void - In case you do not want to capture the authorized amount, you can choose to void it. Checkout the Auth and Capture API.